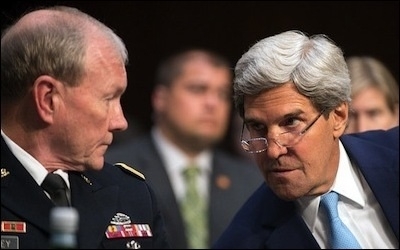 Both U.S. secretary of state John Kerry (right) and the Joint Chiefs' chairman Gen. Martin Dempsey (left) seem to have concluded that working with Iran and its allies to thwart the Islamic State terror organization is a net positive, despite Tehran's long history of opposition to U.S. objectives in the Middle East. In a recent article in The Atlantic, terrorism scholar Martha Crenshaw claimed it would be impossible to fight one enemy—either Iran or ISIS (the Islamic State of Iraq and ash-Sha'm [Greater Syria])—without strengthening the other. It appears the Obama administration agrees with this prognosis and is warming to an expanded role for Tehran in the region. This is not surprising given President Obama's statement last December that Iran could be "a very successful regional power ... that would be good for everybody." Then in early March 2015, the Joint Chiefs' chairman Gen. Martin Dempsey remarked that Iran's efforts against ISIS in Iraq "will in the main have been a positive thing," so long as it did not inflame sectarian tensions. More recently, the State Department has been walking back Secretary of State John Kerry's slip that the administration might be open to negotiating with the Iranian-aligned Syrian dictator, Bashar al-Assad. However, the administration should not be so quick to cede to Tehran's victories in Iraq and Syria as the price for ISIS's destruction. Not only would it be disastrously wrong to defeat a middle-weight Islamist foe by strengthening a far more dangerous Islamist enemy, but the U.S. government is entirely capable of defeating ISIS and rolling back the Tehran regime at the same time. But to accomplish this, it needs more than a plan to "degrade, and ultimately destroy ISIL [ISIS]." The administration needs three sets of policies—for Iran, Iraq, and Syria—with a convergent approach to defeating ISIS. It would be shortsighted to view Tehran as a potential strategic ally. The Islamic Republic's founding father, Ayatollah Ruhollah Khomeini, has castigated the United States as the "Great Satan," and there is no evidence that his successors have abandoned this outlook as evidenced by the recent "death to America" call by Supreme Leader Ayatollah Ali Khamene'i. Moreover, beyond the shared interest in seeing ISIS defeated, Washington's strategic objectives in Iraq and Syria diverge sharply from Tehran's, which seeks to preserve the Assad regime and to dominate Iraq's government and security forces. The U.S. government cannot bracket out these objectives as if the anti-ISIS war were taking place in the middle of nowhere. The Islamist group occupies large swaths of Iraq and Syria, which means any military action against it also affects the internal political situation of those countries. These divergent goals translate into differences in the manner in which any administration would like to see the war prosecuted. Choices about when and where to attack ISIS, and which forces to use, could potentially affect Assad's ability to remain in control of Syria. Whereas Tehran may prefer attacking ISIS forces that threaten Assad's military, U.S. policymakers might favor intervening where ISIS fighters are engaged in atrocities against vulnerable groups in areas less strategically advantageous to the Syrian dictator. Other divergences in priorities could also pose challenges for U.S. military commanders who are being asked to coordinate their decision-making with Iran's military or its proxies. For example, Tehran gives special priority to the Shiite shrine cities of Najaf and Karbala; this priority may not necessarily reflect U.S. military assessments of the threat posed to those locations. Similarly, the Iranian regime has closer relations with some Kurdish parties than others, and thus may be inclined to tailor the fighting to increase the relative power of its favored factions. Tehran often has ulterior motives, and Washington puts itself at risk of being manipulated if it begins to believe that Iranian forces in Iraq and Syria are motivated solely or even predominantly by a shared desire to destroy ISIS. In late January 2015, Israeli missiles killed a group of senior Iranian and Hezbollah officers (including Iranian general Mohammed Ali Allahdadi), and while Tehran presented them as "martyred while defending the shrines and innocent people of Syria," Jerusalem claimed that they were plotting the establishment of a military position for Hezbollah attacks against Israel. Tehran aims at expanding its presence and influence in Iraq and Syria, and what it does in the territory it gains will rarely be in U.S.—or its allies'—interests. The most critical strategic discrepancy, however, pertains to the way in which fighting is being conducted in Iraq's predominantly Sunni provinces of Salah ad-Din, Nineveh, and Anbar (or the Sunni Triangle as the area is known). Bolstering Sunni support in the fight against ISIS is critical to U.S. strategy in Iraq, but the Sunnis are not important to Shiite Iran's strategy, at least not in the way they are to Washington. Washington's interests have partly coincided with Iran's recently, but this has not led to anything resembling a partnership. Tehran is more inclined than Washington or other members of the anti-ISIS coalition to inflict devastating costs on local communities. Contested areas are precisely where the administration and its allies need to focus efforts on developing a viable Sunni opposition to ISIS. However, since Iran's strategy hinges on strengthening its proxies, it has little incentive to prevent these neighborhoods from being purged or ransacked by militant Shiite liberators. British photojournalist Matt Cetti-Roberts, writing for the War Is Boring blog, provided a detailed account of the manner in which Shiite militants went about "liberating" the ISIS-held town of Jalawla. When the Shiites came, they took everything worth taking, according to residents, and stability was not restored until Kurdish peshmerga came. Roberts quotes a Kurdish officer: "The Shia were burning the houses because they saw Jalawla as a 99 percent Sunni town ...They came for revenge. They did not care who the house belonged to." Furthermore, in the eyes of many, a partnership with Tehran entails a tacit acceptance of its tactics and those of its clients. In addition to looting, this includes extra-judicial killings, torture, assassinations, and in Syria, the use of chemical weapons and barrel bombs. In essence, Washington would be providing cover for this behavior and creating space for Iranian-backed ground troops to do such things. Partnering with Tehran would also likely alienate U.S.-Sunni allies throughout the region. Egypt, Saudi Arabia, Jordan, Kuwait, Bahrain, and the United Arab Emirates are all making contributions to the fight against ISIS. But these states understandably worry how this conflict might enhance Iranian power, which threatens the stability of their regimes. If Tehran were to acquire U.S. backing, these states would very likely reassess their support for the fight. The Sunni Arab states refused to back the U.S.-led political process in Iraq following the toppling of Saddam Hussein because they believed Washington was delivering Baghdad to Tehran on a silver platter. The semblance of a U.S. alliance with Tehran in Iraq would likely kindle similar fears and could trigger a Sunni Arab withdrawal from the anti-ISIS coalition. In a recent exchange with Sen. Marco Rubio (Republican of Florida), Secretary Kerry maintained that Tehran "would welcome our bombing ... They want us to destroy IS." This is an unfortunate case of presumptuous mirror-imaging—assuming one knows what one's adversary wants based on what one would want if one were in his position. The fact that Tehran and Washington share an interest in defeating ISIS is hardly a reason to believe the regime would welcome U.S. bombers or cease its efforts to promote anti-U.S. activities in the region. Coincidence of interest on one issue, however important, does not suffice for a partnership. Washington's interests have partly coincided with Iran's in the recent past, but this has not led to anything resembling a partnership. When the U.S. forces invaded Iraq in 2003, they toppled a tyrant who was viewed in Tehran as a major threat and helped establish a replacement government led by Iran's coreligionists. In return, Tehran worked to turn the Iraqi population against the United States and directed its militia proxies to send U.S. soldiers home in body bags. While the Tehran regime may lack the support base in Afghanistan to accomplish as much as it did in Iraq, it has clearly foregone cooperation in favor of obstruction despite its shared interest in keeping the Taliban far from power. There is also al-Qaeda to consider, a terrorist organization that has shown as much zeal for killing Shiite Muslims as it has Americans. One would expect Tehran to have a strong interest in seeing U.S. efforts to defeat al-Qaeda succeed. Instead, it chooses to offer senior al-Qaeda leaders safe haven. Tehran's behavior over the decades has consistently made clear that its chief foreign policy priority is confronting and weakening the United States. Washington and Tehran may have an overlapping interest in defeating ISIS, but this interest is not rooted in a shared strategic vision. Cooperation against ISIS is not likely to advance Washington's larger objectives in the region: to prevent the spread of Islamic extremism; reduce inter-state conflict; solidify diplomatic, military, and economic relationships with key Arab states; cultivate a stable and legitimate political order; and promote a greater respect for human rights. As long as Washington remains committed to keeping large scale combat troops out of Iraq and expects the Iraqis themselves to do the lion's share of the fighting, U.S. strategy should focus on building and professionalizing Baghdad's security forces as well as the Kurdish peshmerga. The focus should be on professionalism, not merely effectiveness. It is important that professional soldiers, not just competent fighters, be ultimately responsible for clearing, holding, and stabilizing the territory now occupied by ISIS. At the same time, Washington must roll back Tehran's influence in Iraq, which has increased exponentially since the departure of U.S. ground troops. To be sure, there are legitimate worries about the Iraqi military's capabilities as a professional army. When ISIS initially launched its grand offensive in June 2014, Iraq's Second Division instantly crumbled, allowing the jihadists to seize territory and heavy weaponry and commit atrocities against the local population. Other units of the Iraqi army also had little success in stopping ISIS's advance, and Shiite militias are largely credited with preventing the Islamist group from taking Baghdad. Yet while the Iraqi military's performance was disgraceful, and U.S. policy makers should be concerned about continuing to invest billions of dollars propping up an ineffective military force, if Washington does not want to send combat brigades again into Iraq, then the Iraqi forces will have to be propped up in some fashion. It should be noted that under close U.S. supervision (and before the U.S. withdrawal of 2011), the Iraqi armed forces proved themselves capable of conducting successful military operations. After U.S. troops departed, Prime Minister Maliki began replacing seasoned officers with cronies. These unprofessional officers began selling surplus ammunition, auctioning off commissions, and creating "ghost soldiers" who exist only on the payroll so senior officers could claim their pay. This corruption resulted in the army devolving into a shell of a defense force. Once corruption is rooted out and discipline restored, the Iraqi army could well become part of the solution. Combating graft in the Iraqi army will also have the effect of reducing Tehran's influence since much of the corruption stems from Shiite military commanders who had previously served in the Badr militia, one of Tehran's foremost military proxies in Iraq. This would, in turn, increase the power of Sunni Iraqis in the military, part of an overall strategic goal of protecting the Sunni Arab population that Washington needs as allies. Protecting the Iraqi Sunnis is just as critical to rolling back Iran as it is to defeating ISIS. Protecting the Sunnis is just as critical to rolling back Iran as it is to defeating ISIS. This requires enabling them to take on a greater role in the fight against the Islamists. Even without deploying combat brigades, the administration could and should establish a strategically influential presence on the ground in Sunni and mixed Sunni-Shiite regions. Not all of these troops need to be U.S. forces, but a significant contingent should be in order to keep eyes and ears on the situation and deter sectarian abuses. Simultaneously, as numerous Arab states are already contributing to the anti-ISIS coalition, they could be persuaded to send peacekeeping contingents to Iraq. These troops would not need to have a role engaging ISIS. Rather their purpose would be to guarantee the safety of Sunni Iraqis in strategically important territory from overzealous Iraqi security forces. Presently, the Shiite militias supported and led by Iran's Islamic Revolutionary Guard Corps (IRGC) are leading the fight against ISIS. As these militants gain ground, Tehran extends and deepens its grip on Iraq. It would be a Pyrrhic victory if Shiite militants defeated ISIS but dragged Iraq into a sectarian civil war in the process. Tehran most likely does not want a civil war in Iraq either, but if its presence sparks one, there is little doubt it will do what it takes to assure its allies win decisively. Since the strategy for defeating ISIS hinges on the Iraqis themselves taking the fight to ISIS, Washington has a strong interest in ensuring a fully-fledged sectarian conflict does not break out. It would not be imprudent to deploy U.S. ground forces to accomplish that mission. Lecturing Baghdad politicians and relying on the professionalism of Iraq's security forces is not enough. That professionalism is a critical goal, not a starting point. Gaining Baghdad's trust and cooperation will undoubtedly require U.S. forces to make a contribution to the military dimension of the conflict that would make it worthwhile for Baghdad to stand up to Tehran and assert its independence. This should not be an insurmountable challenge if Washington is willing to raise its level of commitment. U.S. forces will need to take an active role in planning operations to retake cities and towns from ISIS. Tehran cannot match U.S. airpower, its intelligence, surveillance, and reconnaissance (ISR) capabilities, or its operational and strategic planning means. While airpower alone will not win a war, it is critical to prepping the battlefield and facilitating the advance of ground troops. In June 2015, the U.S.-led coalition launched 1,686 airstrikes, part of a year-to-date total of 2,764 flights with at least one weapon released and 11,061 total sorties, according to U.S. Air Forces Central Command. The Air Force is capable of doing more. U.S. forces similarly dwarf Iran's ISR capability, which is critical for enabling Iraqi soldiers to monitor their forward routes, guard against improvised explosive devices and ambushes, gain an early warning in advance of an attack, or locate top tier ISIS leadership. As these elements of warfare come to prove increasingly critical to the success of its troops on the ground, Baghdad may very well reconsider the wisdom of allowing the Iranians to be its primary security partners. U.S. forces, however, should not be limited to training and advising roles. It is becoming increasingly likely that in the near future, they will need to take an active role in planning operations to retake cities and towns from ISIS. As important as materiel support is, in the absence of actual leadership on the ground, criticisms such as those made by Badr militia commander Hadi Amiri that "those who kiss the hand of the Americans get nothing in return," will start to ring true. If necessary, U.S. troops should become available to clear and hold key terrain. At the very least, it is unwise to rule out the possibility of U.S. troops on the ground in advance. It would be a potentially costly strategic oversight to cede leadership of ground force operations in Iraq to IRGC generals. 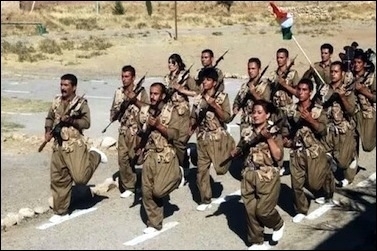 Following the collapse of the Iraqi army, many analysts were quick to point to the Kurdish peshmerga as the most reliable fighting force in the region. This may be largely true, but it should not lead Washington to overestimate the peshmerga's capacity or overlook internal rivalries between Kurdish groups and other significant issues, including corruption and poor training. Finally, there is the matter of the Iraqi Kurdish peshmerga, military forces associated with the two major political parties of the Kurdistan Regional Government. They also need U.S. training, supervision, and leadership. Following the collapse of the Iraqi army, many pundits were quick to point to the peshmerga as the most reliable fighting force in the region. This may have been true, but it should not lead Washington to overestimate the latter's capacity. The peshmerga suffer from many of the same problems as the Iraqi army: corruption, poor training, ghost soldiers, mistrust due to the partisan and ethnic nature of the force, and lack of equipment. When ISIS invaded northern Iraq, the peshmerga offered little resistance and did very little to protect the Yazidis who were being massacred in Sinjar. The intense rivalry between the Kurdish Democratic Party and the Patriotic Union of Kurdistan has led to poor cooperation between their respective fighting forces. Nor do the peshmerga have a good working relationship with the Iraqi army. Defeating ISIS will undoubtedly require unity of effort. A strong U.S. presence among the Iraqi Kurds would likely help considerably. The U.S. strategy for defeating both ISIS and Assad in Syria should begin with the Syrian Kurds. The Popular Protection Units (Yekîneyên Parastina Gel) of the Syrian Kurds, seen here, are religiously tolerant moderates who have fought effectively against ISIS with little outside help. Washington's strategy for defeating both ISIS and the Assad regime should begin with the Syrian Kurds. While the administration may be relying overmuch on the Iraqi peshmerga, Michael Rubin of the American Enterprise Institute has made the case persuasively that Washington needs to stop neglecting the Popular Protection Units (Yekîneyên Parastina Gel, or YPG) of the Syrian Kurds, who proved their mettle by withstanding ISIS's siege of Kobane in northern Syria. 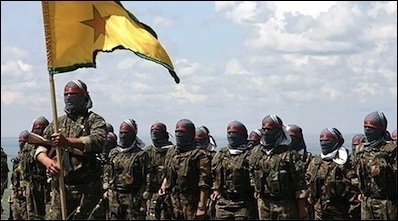 The YPG are religiously tolerant moderates who have fought effectively against ISIS with little outside support. They are affiliated with the Kurdistan Workers' Party (Partiya Karkerên Kurdistan or PKK), which the State Department has labeled a terrorist group apparently to appease Ankara. In the meantime, the Turks are working toward their own peace accord with the PKK. It would be foolish to allow the pace of internal Turkish politics keep Washington from supporting the armed faction that is presently positioned to be its most viable partner on the ground in Syria. The Kurds, however, are not enough. The more moderate elements of the Syrian Arab opposition are indispensable to a successful U.S. strategy in Syria. The U.S.-led coalition should focus first and foremost on driving ISIS out of Iraq, then on eliminating its capacity to successfully attack Kurdish territory in Iraq, Syria, or Turkey. As ISIS loses ground on its eastern and northern borders, it might finally engage Assad's forces on its western front as this would be its only remaining avenue for expansion in the Levant. At that point, the Syrian moderates will come to play a pivotal role. The moderate Syrian resistance is often derided as being a completely fictitious entity. This criticism is baseless but could become a self-fulfilling prophecy. Take the case of Harakat Hazm (Steadfastness Movement) which emerged in January 2014 as a promising military force with a secular ideology only to find half-hearted Western backing. In February 2015, its headquarters were overrun by Jabhat an-Nusra, Syria's al-Qaeda affiliate, and the surviving members disbanded. If Harakat Hazm no longer exists, that may tell more about the U.S. mismanagement of support than about the group's original potential. Critics of the idea of supporting the moderate opposition generally base their argument on the premise that Western-friendly opposition forces in Syria are too small and too weak to compete against the regime, ISIS, or their jihadist counterparts. Some argue that, at best, such groups might contribute to ISIS's toppling of Assad but would then simply be purged by ISIS or other jihadist groups in the aftermath. This concern might have validity if the conflict is seen as ending in the near future. But since a quick resolution of the Syrian civil war seems unlikely, this objection is premature. A prudent approach would be to keep Western-trained, moderate fighters out of the fight completely for several months. Presently, an-Nusra and other jihadist groups are targeting these moderates in order to "purify" the resistance. If these lightly-trained and lightly-armed, Western-backed rebels were not providing jihadists with such easy targets, those Islamists might well return their focus to fighting Assad. ISIS seems powerful enough to make it probable that the conflict will continue for at least two or three more years. Washington needs to prepare the moderate opposition for the endgame, not the present fight. ISIS seems powerful enough at this point to make it highly probable that the conflict will continue for at least two or three more years. In the meantime, the U.S. administration should be readying a core group of trustworthy moderates to accomplish the tasks that will be necessary to transition Syria to new governance. Washington should train them to build an effective, nationwide political organization; to cultivate intelligence networks that will help clarify the situation on the ground when the time comes to liberate key cities and towns; to communicate with the Syrian public and international community; to effectively govern and provide security, and to negotiate peace with remaining regime forces. These are primarily non-military functions, so Washington does not risk its materiel falling into the wrong hands and being turned against it. The moderates should, of course, receive combat training as well, but the bulk of U.S. military aid should be delivered to them only after they have sufficiently demonstrated that they are truly ideologically moderate and politically competent. At the same time, there are serious problems with the training program of the Syrian resistance as it is currently being conducted. Training bases are located in Saudi Arabia, Turkey, and Qatar, but the latter two at least have not proved themselves reliable allies in the fight against jihadism. Working with partners in Egypt, Jordan, or the United Arab Emirates would be preferable. The bigger problem is that the length and focus of the training program may be inadequate. Certain details of the program remain classified, but news reports citing U.S. military planners indicate groups of three hundred trainees are receiving six to eight weeks of training before being sent back to fight in Syria. This is little more than a recipe for producing cannon fodder. There is no good reason for sending lightly-trained, lightly-armed fighters into the Syrian theater. This allows Assad's forces to rest or improve their position while the Islamist resistance goes about exterminating the ill-prepared and unprotected moderates. It is an underlying assumption of many pundits and military decision-makers that if ISIS does the lion's share of the fighting against the regime, the country will belong to them once Assad is deposed. For example, Julian Lewis, chair of Britain's defence select committee, said it was impossible to intervene in Syria without helping either the Islamist terrorists in the north of the country or the Assad regime. But if the moderate opposition could effectively demonstrate its competence and strength, it is possible that many Syrians would be more inclined to support them rather than ISIS, regardless of who contributed more to the dictator's defeat. ISIS is an extremist and dangerous proto-state that engages in habitual atrocities against the people who live in the territories under its control. It enslaves people, forcibly marries off young girls, trains boys to become bombs, destroys ancient artifacts, outlaws religions other than its own brand of Islam, ritualistically executes people in public, performs mass beheadings, and promotes a ghoulish worldview via social media to lure jihadist wannabes throughout the world. Even without its threat to regional stability, it would be safe to say that expediting its demise would be in the best interest of the United States. The U.S. strategy for defeating ISIS, however, must look beyond finding the quickest and easiest means of killing terrorists and destroying terrorist bases and consider how to rout them without compromising Washington's interests in Iran, Iraq, Syria, and the Middle East more broadly. David A. Patten is a defense contractor in northern Virginia and an Iraq war veteran. He holds a Ph.D. in philosophy from Stony Brook University and a masters in security studies from Georgetown University. The Atlantic, Mar. 11, 2015. National Public Radio, Dec. 29, 2014. The New York Times, Mar. 3, 2015. White House Press Office, Sept. 10, 2014. The Times of Israel (Jerusalem), Mar. 21, 2015. BBC News (London), Jan. 19, 2015. Small Wars Professionals (blog), Feb. 24, 2015. Anthony H. Cordesman, Peter Alsis, Adam Mausner, and Charles Loi, "The Real Outcome of the Iraq War: U.S. and Iranian Strategic Competition in Iraq," Dec. 20, 2011. Kenneth Katzman, "Iran's Influence in Iraq," CRS Report for Congress, Feb. 2, 2007. NBC Nightly News, June 24, 2005. The Guardian (London), June 11, 2014. Ibid., June 15, 2014; The Telegraph (London), June 21, 2014. The New York Times, Nov. 24, 2014. Air Force Times, July 14, 2015. United States Institute of Peace, Washington, D.C., May 11, 2015. The Military Times (Springfield, Va.), Mar. 13, 2015. The Daily Beast (New York), Aug. 17, 2015. Michael Rubin, "The U.S. Gets the Kurds Wrong—Again," The Wall Street Journal, Feb. 13, 2014; Commentary, May 17, 2015. National Public Radio, Sept. 23, 2014. The Washington Post, Feb. 28, 2015. See, for example, Tamara Cofman Wittes, "The regional impact of U.S. policy toward Iraq and Syria," Brookings Institution, Washington, D.C., Apr. 30, 2015. Voice of America, June 27, 2015. Al-Jazeera TV (Doha), Feb. 18, 2015. The Independent (London), July 18, 2015. Related Topics: Iran, Iraq, Syria, US policy | David A. Patten | Fall 2015 MEQ receive the latest by email: subscribe to the free mef mailing list This text may be reposted or forwarded so long as it is presented as an integral whole with complete and accurate information provided about its author, date, place of publication, and original URL.